عبدی, فریدون. (1389). سیری اجمالی بر اندیشه نظامی و نظام حاکم بر حوزه جنگ و دفاع در طول تاریخ ایران. علوم و فنون نظامی, 7(17), 79-96. فریدون عبدی. "سیری اجمالی بر اندیشه نظامی و نظام حاکم بر حوزه جنگ و دفاع در طول تاریخ ایران". علوم و فنون نظامی, 7, 17, 1389, 79-96. عبدی, فریدون. (1389). 'سیری اجمالی بر اندیشه نظامی و نظام حاکم بر حوزه جنگ و دفاع در طول تاریخ ایران', علوم و فنون نظامی, 7(17), pp. 79-96. عبدی, فریدون. سیری اجمالی بر اندیشه نظامی و نظام حاکم بر حوزه جنگ و دفاع در طول تاریخ ایران. 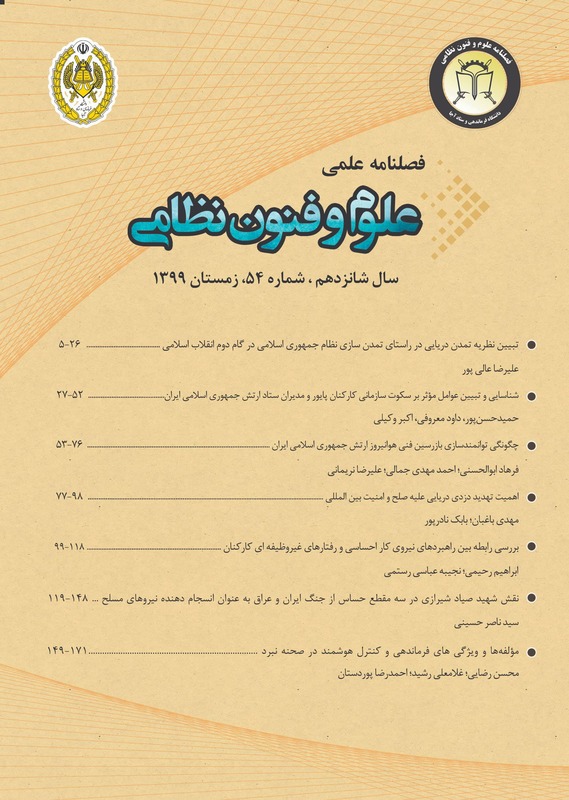 علوم و فنون نظامی, 1389; 7(17): 79-96.
history of Iran, it is realized that the most important Iranians defensive excellence is having different ideas and techniques of war and use of this military thoughts in battles and prowess of various tribes of Iranian peoples against their enemies which historically have been aimed to establish values. So getting more familiar with various military ideas and theories and the system dominated on war and defense field has been important during the Iran’s history has played an important role in role in increasing the experience, knowledge, consciousness, awakening and insight of every armed force personnel against the hegemonic powers and aggressors.